A sporty loop takes your dog in and out of kettle depressions and across ridges for almost three miles. The sandy shore on the south side of the island is almost lake-like and the sandy bottom continues out far into the water. The waves come fast and furious on the Hampton beaches and this one is no exception. 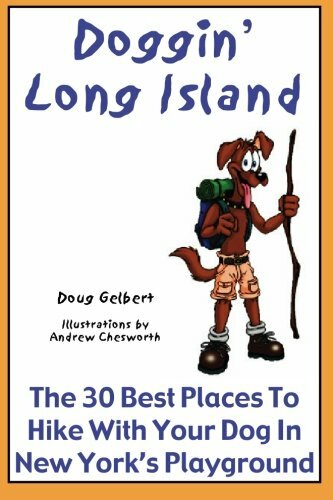 The only attraction here is Long Island’s oldest grove of white pines but that is enough to enthrall your dog during his adventure here. You won’t see anything but the sky above on this hike through dense beach heather but in short time your dog will be hiking on open bluffs above the Atlantic Ocean. The Otis Pike Wilderness Area opens to your dog after Labor Day for seven miles of hiking on the wide, sand beach and behind the dunes. This 3/4-mile loop travels over and around 80-foot high sand dunes, moving past ghost forests buried in the shifting sands. From the Revolutionary War, when it was used as an artillery practice range, through the Cold War Camp Hero has hosted the United States military. The immortal racehorse Man O’ War may have loped on the easy route around the park’s centerpiece lake. No need to limit yourself to a pre-determined route on a hike with your dog around the grounds of a former hospital. There is no reason to come to this park with a maze of short trails on the Great south Bay without a dog. Not many do.